In 2013, I was honored by Northern Kentucky University, which is among the top 15 percent of business schools in the world (and accredited by the AACSB), as the recipient of the outstanding student award. I was selected for that for both my career and academic (business informatics major) accomplishments. 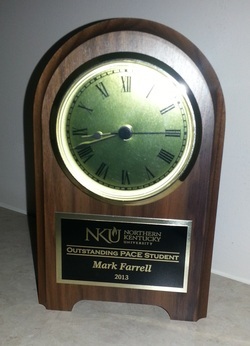 The event was held at NKU, which was attended by many professors and chairpersons at the university, as well as many students who were inducted into the honor society. You can briefly read about the event in the May 2013 newsletter provided by NKU (see p. 2) below. Also, see a couple of the recommendations that I received for the award.